There is a bit of confusion about our opening hours! When we opened the studio there was only one dentist so we were more limited with what we could offer. 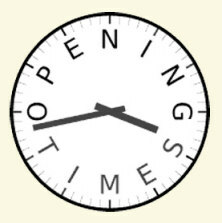 We are delighted to announce that we are now open 8am to 8pm 5 days a week. We are hopeful that this will make the dental experience a little more convenient as we really understand the pressures our patients are under with work and family commitments these days. We are also one of a few local dentists open Saturdays where available and will always endeavour to look after people out of hours if an emergency does arise. We are very proud of Paul working so hard over the last 4 months! He stays late to accommodate patients and is still offering free orthodontic consultations, which keeps everyone happy! He is happy to announce that he is now working with us on Tuesdays as well as Fridays from now on so it will be even more convenient to get your teeth straightened. If you would like to make an appointment or a no obligation enquiry, you can call on 01 2871000 or fill out our Appointment Form and we will phone you back.